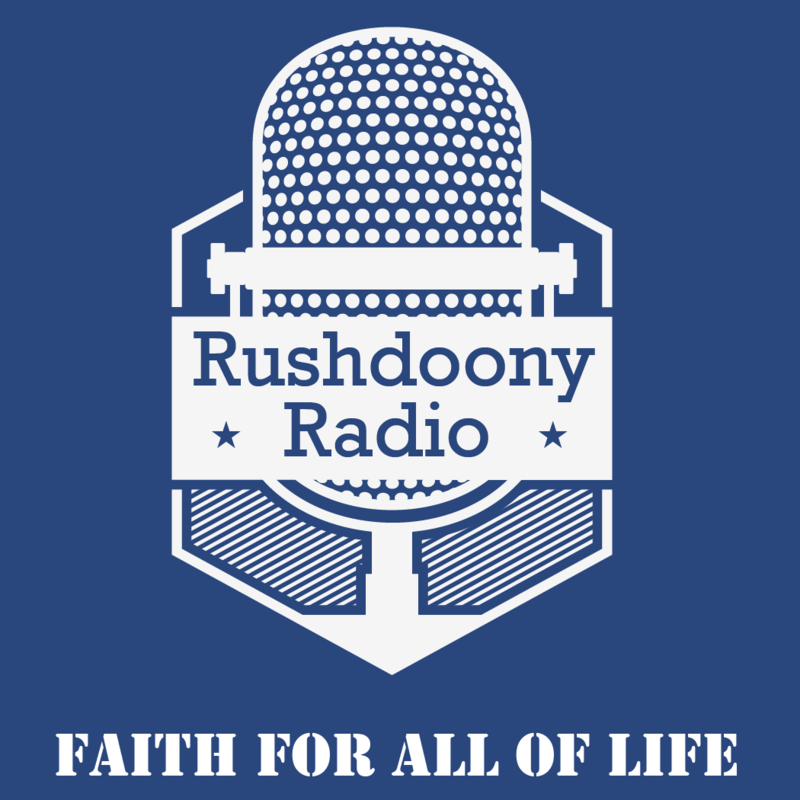 R.J. Rushdoony: 00:00 Let us begin with prayer. Almighty God, our heavenly Father, we come to Thee again mindful that Thou art the Lord. Thou art King of kings and Lord of lords, that the government of all things is upon Thy shoulders. And so, our God, we come to Thee for the heathen rage against Thee and Thy kingdom. They persecute Thy saints. They seek to set aside Thy law, and Thy government. Give us strength and power as we content against the powers of darkness, and make us more than conquerors in Jesus Christ. We remember in prayer all those who are on trial, who are persecuted, and who are sorely oppressed because of the wrath of the humanists. Comfort, strengthen, and bless them we beseech Thee, in Jesus’ name. Amen. R.J. Rushdoony: 01:17 We began last time our studies in the theology of the state, and as we saw, that problem is no longer the same as we have had it over the centuries. What Constantine attempted to do was something, however we may and many do disagree with him, a valid goal. Constantine felt that both church and state should serve the Lord, and so he brought them together not in order to subordinate the church nor to use it, although certainly he felt the church was most useful for the welfare of the kingdom, but in order to bring them to a common purpose. But that purpose now has ended. What people do who criticize Constantine, and I do not say he is beyond criticism, is to fail to see that what we are suffering from now is the end of Constantine’s program. R.J. Rushdoony: 02:39 Civil government is no longer seeking to establish a Christian social order. Rather, it is seeking to establish an anti-Christian society, a humanistic society, a humanistic system of education, humanistic laws, [inaudible 00:03:01] money at every point to establish something that is anti-God. The state, in other words, is no longer seeking to be Christian. It is anti-Christian. R.J. Rushdoony: 03:22 Now in the old order, there were problems. The empire tended to identify God and the world order much too closely. Sometimes indeed the empire was very close to the Pagan view of the divine state and salvation by political order. Certainly, this was true of men like Frederick the Second, the Hohenstaufen ruler of the Holy Roman Empire. But by and large many of the Christian rulers, whatever their sins, were still dedicated to the concept of a Christian order, only they saw themselves as at the head of it. R.J. Rushdoony: 04:15 Now, our concern in our first session tonight is not so much with the state. We’ll come back to that in the second session. Our subject is religion and the church. The church has worked too often to separate itself from the world rather than to work in the world and to bring the world to Christ. It has had really a monastic view of the church. R.J. Rushdoony: 06:21 This was the program of the empire. But the program of the church too often was to say that the world outside the borders of the church was really unredeemable unless the church took over, the church controlled it, unless it came inside the church, so that it was not that the state can and should be Christian or that the family or all the various spears of life have a duty together with the church to be Christian, but rather that they are outside the faith unless they are under the church. As a result, very serious problems developed. R.J. Rushdoony: 07:15 Like the empire the church, identified itself too closely with God as though God’s work could not be done except through them. Now, you had another complicating factor which is still with us. There was a great deal of Platonism within the church, and Platonism lead to otherworldly thinking. As a result, the Platonists were ready to surrender the church to the state and every era when Platonism was too powerful in the thinking of the church, men were ready to let the state rule the church. R.J. Rushdoony: 08:06 And we have that same kind of otherworldliness with us today. Very commonly, churchmen will say, “Politics is a dirty business.” Many will not even vote. They will not concern themselves with the practical problems that confront us as Christians because, “Well, there’s no saving that world out there. The only place for a Christian is in the church.” And so many, many protestants turn their local church into a kind of convent or a monastery and say, “Come in here. Don’t think about that world out there or about politics or economics or anything else. Let’s have another prayer meeting and let’s forget about those problems,” and the result is the world is indeed surrendered to the devil. This kind of perspective makes the problem beyond solution because it is surrender. R.J. Rushdoony: 09:19 There’s another factor that has complicated the thinking of the church. The great error of the Roman Empire was its belief in simplicity. “Simplify everything,” they said. When you emphasize simplicity of organization, you centralize, and every time Rome had a problem it dealt with it by centralizing power at the top. That’s a heresy and an evil we should be very familiar with because that is what we, in the past 50 years especially, have subscribed to as a nation. The more Rome centralized, the more incompetent it became until finally it collapsed. It broke down, and we too are guilty of that heresy of simplicity which leads to centralization. R.J. Rushdoony: 10:38 The state today is reproducing the Roman evil. The church is doing the same thing. How? Well, the church has a simple solution to all problems. Well, let’s get more spiritual and we’ll solve all our problems if we are more spiritually minded. So devotional exercises, retreats, and like things are stressed, but no confronting the problem. No saying, “What does the word of God say concerning politics, concerning economics, concerning education, concerning all these problems?” As a result this heresy of simplicity, of simplifying as though that provides an answer, is creating problems for the church today. R.J. Rushdoony: 11:48 Meanwhile, the 20th century is moving headstrong to the old Pagan dream of a unitary order, of the whole world united together under one administration. This dream goes back, the Bible tells us, to the Tower of Babel. The builders of the Tower of Babel said, “Go to, let us build us a tower, the top of which shall reach unto heaven.” We have that idea of the Tower of Babel still with us today in a great deal of thinking, including lodges with their degrees because the Tower of Babel was a stepped pyramid, and it was also an administrative center. And on each floor there were offices and rooms and sanctuaries, and the higher you were in your degree, the closer you were to the ruling elite, and the whole world was to be governed by this pyramid of power. It was centralization. R.J. Rushdoony: 13:14 God brought confusion on it then dramatically. But always in history, confusion has come to the state and the world when it seeks to create that kind of social order. We have that dream today in Marxism and it’s leading them to bankruptcy. We have it in our country. We have it in the United Nations. And it is everywhere an example of sterility and an invitation to disaster. Our key problem, therefore, today that we as Christians must think about is the relationship of Christianity to both church and state, because the church has largely become humanistic and the state is openly so, and so they have abandoned the word of God to find man made answers to social problems. R.J. Rushdoony: 14:14 But the church is a Christian institution. No other religion has a church. Other religions may have a temple, but no community of believers. The community is the state. But the church is not only a community apart from the state of a called people. It is a supernatural community with a supernatural head, Jesus Christ, and it has a commission, a commission to go into all the world and make disciples of all nations, bringing them to a saving knowledge of Jesus Christ, putting them under the total word of God, teaching them all things that I’ve commanded you. R.J. Rushdoony: 17:20 The church is an anti-Babel institution. It is committed to a radical decentralization of man’s society because the unity is not in this world but in Christ. So we cannot say, “Alright, let’s all come under one government, one church.” No, the unity is not in us nor in what man does, but in the Lord. Feudalism was not an accident of history. As against Rome with it’s total centralization so that no man had any freedom. When Rome fell, the peoples of Europe, the Christian people said, “No, government begins with us on the ground level,” and out of the anarchy of collapse arose feudalism. R.J. Rushdoony: 18:32 And federalism is a word that comes out of feudalism. It emphasizes the local group, the local church, the local governmental unit, the family. But the old unitary Tower of Babel view is all around us, and the church is being dismantled all over the world by civil governments in order to make the way for a super state. The scripture tells us, our Lord tells us, that all power, all authority in heaven and Earth, is given unto him. And so as we face the waywardness of modern man and the state, we must always remember that we are more than conquerors through Jesus Christ, our Lord. R.J. Rushdoony: 19:34 Are there any questions now on our subject? Speaker 2: 19:53 Could you repeat what you said about wineskins, the analogy? Wineskins represent institutions and something else, and I didn’t catch all of it. R.J. Rushdoony: 20:00 Yes, wineskins represent institutions, social agencies, churches, all the various areas of life and spheres of organization. And what our Lord said was, “You cannot have new wine in old wineskins,” because the new wine is going to expand and it has to have a new wineskin that can take that expansion, and this is why there are so many churches breaking away from denominations now. R.J. Rushdoony: 20:43 Douglas Kelly and I heard yesterday of the tremendous tensions that are rending the Catholic church apart, or are about to do so, because on the one hand you have new wine, on the other hand you have old wineskins. New wine demands new wineskins. So we have an obligation to create new wineskins, new churches, new schools, a new civil government, renewed from the ground up. New life everywhere, new institution. This is our calling. R.J. Rushdoony: 21:32 Any other questions or comments? Speaker 3: 21:41 You made a comment [inaudible 00:21:43] and I never looked at it this way and you were talking about how the modernism that’s in the church and why people would have really a hard time accepting Biblical law because it is so modern, and we’re talking about people who accept the word of God as their faith and rule [inaudible 00:22:04]. Could you comment a little bit more on that in the sense, the idea at least … You were applying modernism to those who really do accept the word of God, or claim to. R.J. Rushdoony: 22:19 Oh, yes. Today many who claim to believe the Bible from cover to cover have so limited the relevancy of most of it that if they were to take what they actually believe is still the valid word of God and put it between covers, they’d have a Bible that would be hardly more than a pamphlet. So very often they have a Bible as small as that of the modernists, but the Bible from cover to cover is the every word of God. A man shall not and cannot live by bread alone, but by every word that proceedeth out of the mouth of God. R.J. Rushdoony: 23:12 Any other comments? If not, let us take a break for a few minutes and then we’ll resume with our second session.